Contrary to conventional wisdom, I argue that selfishness is a virtue and that we need more of it. For most people being called selfish is an accusation, not praise. For example, my undergraduate students asked why I use such a negative term; they have been taught that selfishness is bad and felt uncomfortable calling choices or actions selfish. Why does selfishness have such a bad rap? The dictionary defines selfishness as “concern with one’s self-interest”—something we all must have to survive and be happy. Obviously, those who abhor selfishness have not consulted their dictionaries. Instead, they think that pursuing self-interest unavoidably involves exploitation of others for selfish gain. According to this conventional view of selfishness, legitimate pursuit of one’s interests, such as working hard to create wealth is the same as robbing someone else’s productive efforts. In this view, a productive creator like Steve Jobs is equal to Bernie Madoff, the crook, and selfishness is a zero-sum game: somebody’s gain must be someone else’s loss. But the conventional view of selfishness is mistaken. It involves a logical fallacy that Ayn Rand called a package deal: lumping together fundamentally different things that are superficially similar. According to the package deal view of selfishness, a businessperson who legitimately acquires wealth by creating it through production and trade is equal to a crook who acquires wealth by defrauding others. No wonder my students and others recoil at the term “selfish”! What does selfishness—concern with one’s self-interest—really mean and why we need more of it? There are three key points: 1) selfishness is necessary for human survival and well-being, 2) selfishness does not involve exploitation of others, and 3) the only selfish means of dealing with others is voluntary trade. Most people recognize that to survive and be happy, we must pursue and achieve values from food and shelter to meaningful, challenging work to satisfying social relationships. However, the conventional morality of altruism demands we put others’ interests ahead of our own, only taking the bare minimum: enough to maintain our strength to keep serving others. Unquestioning acceptance of altruism makes people feel guilty about being selfish: there is always uncertainty as to what the bare minimum is and what is too much for oneself. Altruism demands philanthropy of business, and no matter how much companies give, it is never enough. But altruism is the wrong standard for business firms: let them pursue selfishness and create wealth—we all will be better off. But isn’t business a zero-sum game? By definition, business pursues self-interest: profit-making is selfish. However, that does not mean that companies’ selfish gain is their customers’ (or employees’ or suppliers’) loss. Companies cannot make profits by exploiting others. This is sometimes hard to grasp because according to the conventional view, people’s interests clash. Even after a lot of discussion of this some of my students still argue that someone’s gain is another’s loss. For example, they claim that it is in a CEO’s self-interest to choose a vendor with an inferior, more expensive product based on a personal kick-back which obviously is not in the interest of his company. Or, that it is in the interest of a company to deceive its customers by selling them defective products. Such exploitation of others is not selfish, of course. Selfishness means the pursuit of self-interest in the long-term, which cannot involve the violation of others’ rights through initiation of physical force or fraud. 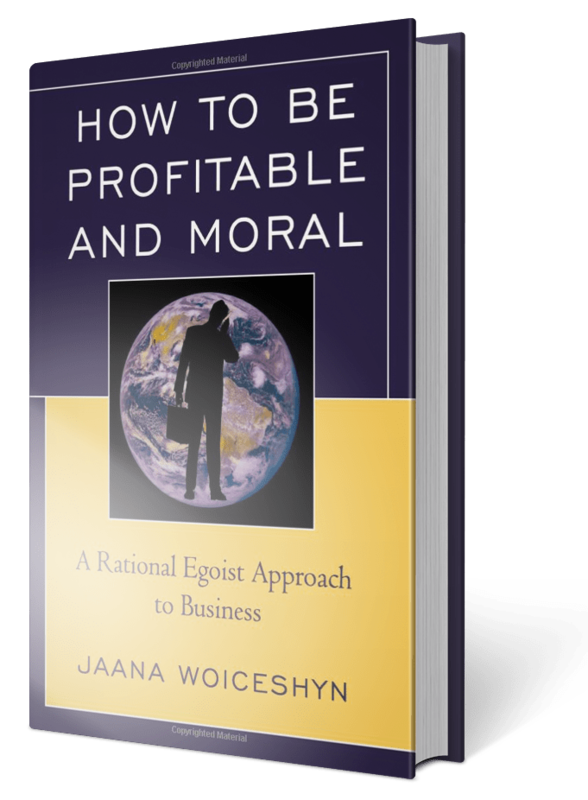 It is impossible to achieve long-term values in business or other realms of life without the co-operation others—undermining their productive efforts through force or fraud would be self-destructive. Selfish dealing with others is not a zero-sum game but a plus-sum game. When you last bought a new smart phone or a laptop, it wasn’t your loss and the vendor’s gain. The vendor didn’t exploit you for its selfish gain: you bought the phone or the laptop because it was worth more to you than the price you paid; you gained from the deal. But the vendor gained also: the price you paid was more than the vendor’s cost of capital and operations; the vendor profited. This is what a plus-sum game means. It is selfish: it based on voluntary trade, for mutual benefit. Voluntarily trading value for value is the only selfish means of dealing with others in business and beyond. Sacrificing for or exploiting others are both harmful to human survival and well-being. Trying to gain a value by force or fraud, such as the vendor deceiving you into buying a phone without the features you specified, does not lead to gaining values and is unsustainable: the vendor’s reputation would be damaged, hurting any future profitability. We need to reject any kind of sacrifice and embrace selfishness: pursuit of self-interest by creating values and trading them with others without force and fraud. We all stand to benefit from more selfishness. Great post! I like that you included the reactions that some of your students have due to their concept of selfishness. I’m curious to know if you have witnessed any of your students rethink their concept of selfishness and come to embrace it as a positive. Many students come to at least understand egoism as different from cynical exploitation, and some do embrace it. (But there are always some that cannot think in fundamentals and do not want to relinquish what they have been taught most of their lives). I think it is important that business students know that there is an alternative to altruism and cynical exploitation.